Splash pages, you gotta love 'em. A blank canvas where the artist can hit you with a large dose of illustrated 'wow'. At Christmas, I always flashback to the titles I've dug the most over the years. One of the biggest (and the first title I ever collected from issue one), bore this killer Mike Manley drawn splashie in it's first few pages. 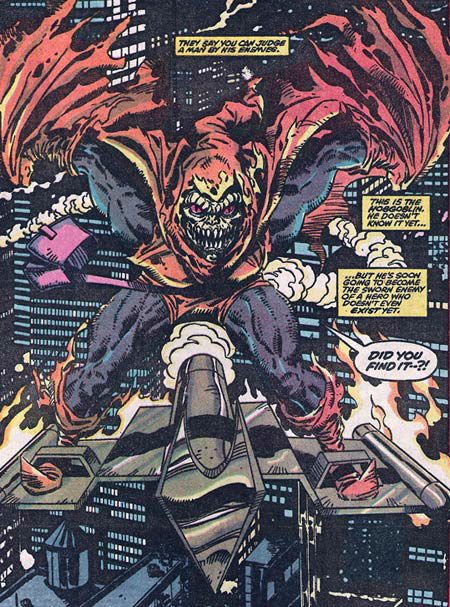 I wasn't a huge fan of the demon/Hobgoblin, but I worshipped earlier Hobby adventures, especially his drama with The Rose that shook out in Web of Spider-Man. Hence having him debut in this first issue, again dealing with mobsters, meant I had to be on the right path. If you read the book in question, then you would know the same 'bazinga' type moment I felt. If not and you want to find out what happened next, well those pesky little tags at the base of these posts always give everything away anyway right? by the way mate, the latest issue of Suicide Squad was wicked, just when you think you know where the writing is going it flips a uturn.